Find the best flip and rental opportunities on the market using Pellego's unique search portal. 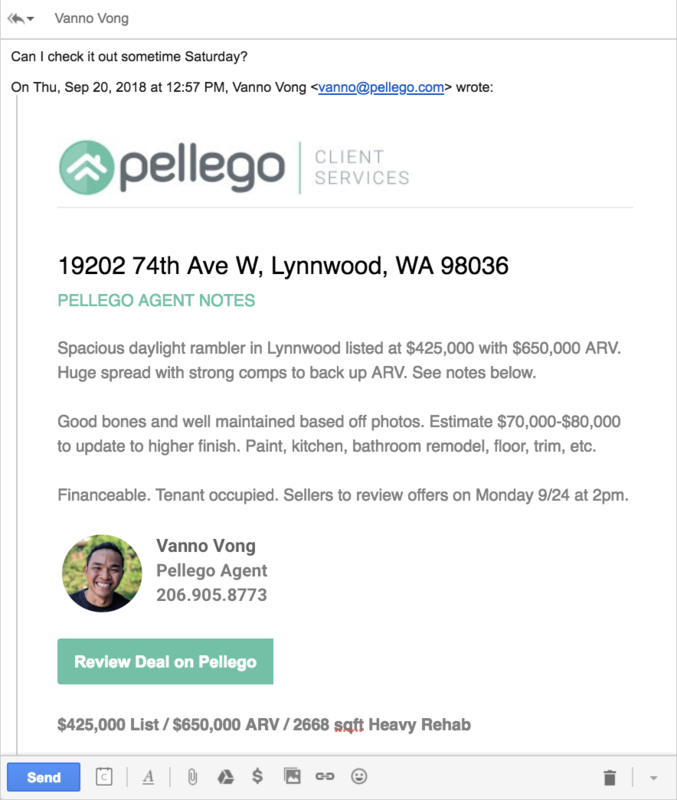 Filter through thousands of active listings by estimated investment criteria, calculated 24/7 with Pellego's flip and rental templates and some data science. Browse deals as flips or rentals. Set multiple locations at the same time. Find upside potential with unfinished square footage and underutilized zoning. Save searches and deals for easy reference. Set alerts on searches to get emails with new matches. Follow specific deals to get email alerts about listing updates. Work with Pellego agents to pursue and purchase properties through Pellego. Set a primary agent to see which listings they have reviewed, along with their notes, analysis, and contact form for asking questions and requesting info. Hang your agent license with Pellego and access to tools, support, and join a community built for investment-minded agents. Purchase deals for yourself and do your own thing, or work with your investor clients through Pellego. Turn your analysis into professionally organized spreadsheets and PDF deal summaries. Export your Pellego analysis as an editable Google Sheet, pre-filled with your assumptions and contact information, along with listing photos, interactive graphs, and comprehensive comp and rehab breakdowns. Turn your finished spreadsheet analysis into a perfectly formatted PDF, or download it directly from Pellego. Share the PDF as a single page summary or a five-page presentation with all of your assumptions. If you are working with a Pellego Pro agent, they can grant you access to the search pages. If you are not already working with a Pellego Pro, you can access the search pages with a $500/yr deposit, credited back if/when you purchase with a Pellego Pro. ‍The flip and rental search pages are available for non-licensed individuals. For individuals without an agent license CA or WA. Can you connect me with contractors and lenders? Contractors, no. Lenders, yes. Because contractors are in short supply, any contractor we recommend would quickly become too busy or expensive for the original investor who told us about the contractor. As such, we currently do not connect our clients with contractors. However, because lenders contact us with new offerings and we see what our clients are getting, we an evolving list of lenders that we are happy to introduce clients to. In some cases, these lenders pay us referral fees. To ensure you stay competitive, we do not allow referral fees that increase the total cost beyond what the lender offers without a referral fee. Do you have off market deals? Why should I bother with MLS deals? Yes. Many wholesalers use Pellego and let us know when they have new inventory. We review the deal and the contract and alert the clients that have given us matching criteria. Thought it may seem counter-intuitive, we encourage our clients to focus firstly on the MLS deals, or what we think of as "pre-contract." From analyzing greater Seattle-area flips since 2002, we see that MLS purchased flips more often than not outperform off-market purchased flips. Additionally, more flips are purchased on the MLS than off-market. First, we leverage our data-science core to sort listings, not by how attractively they are priced, but by the probability the seller will sell for the price our clients need. Since we started applying this method in 2016, our clients have consistently purchased more houses below their list price than above (in 2017, in Seattle). Second, our clients can literally offer more than competitors because we only charge 1% for negotiating and brokering a transaction. This allows our clients to offer as much as 5% more on their purchase price without changing their margin, after considering the savings on the listings. This means that our clients can even compete for popular, obvious deals that get bidding wars. Third, our clients can make more offers in less time, and do so with more confidence. They can do this because we maintain a distributed team of field agents that document houses when we identify them, with extra videos, photos, and notes. This field report service is available to any of our clients, whether or not we identified the listing. Our clients also gain efficiency with their offer process, because centralize our client bidding process so that only the strong client has to go through the signing and countersigning process. Do I have to use a Pellego agent or can I use any agent I want? We do not require any of our clients to use our listing service when they are ready to sell properties they purchased with Pellego. Our philosophy is to earn your business with every transaction. How do I work with Pellego if I am an agent? Many of our clients are agents themselves. We treat agents the same as our clients, in that we expect them to sign a flexible, non-exclusive buyer agency agreement. Most of our agent clients use our service when they purchase and then either list the property themselves or use Pellego as a co-listing service to handle the operations. On a case-by-case basis, we also provide license hanging services to experienced investors who use their license for their own purposes. I’m a wholesaler. How can I work with Pellego? Our principal focus is to help investors buy properties. We welcome the opportunity to provide investors with additional deals brought to Pellego by wholesalers. If you have a deal under contract or want to touch base with us before getting a deal under contract, contact your Pellego rep or email us at deals@pellego.com.